The mule that killed a mountain lion-Fiction! - Truth or Fiction? 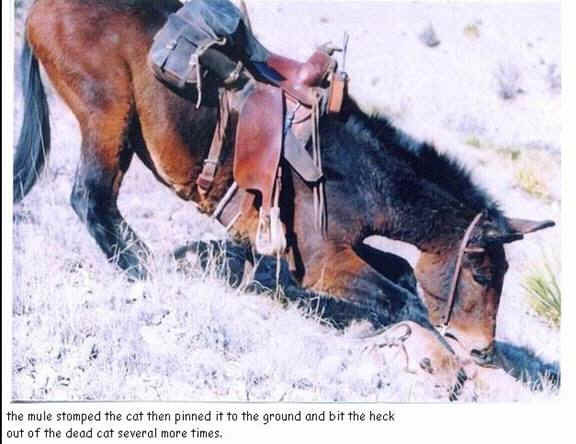 The mule that killed a mountain lion-Fiction! 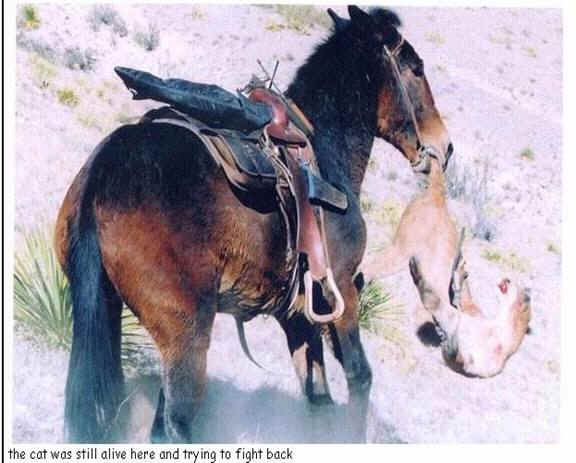 The Mule that Killed the Mountain Lion-Fiction! 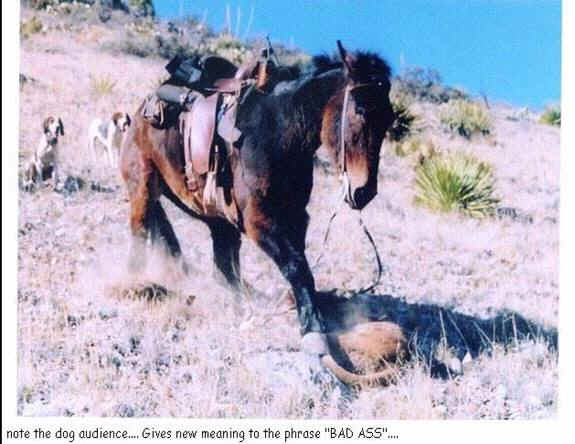 A series of pictures of a saddled mule making sport of a mountain lion. The accompanying story says the lion was stalking the hunting dogs of a Montana couple while they were out on the range. The man was going to fire a warning shot to scare the lion but before he could do it, his mule grabbed the lion and killed it by whirling it around and banging the lions head on the ground. Then the mule put down the dead lion and acted as though nothing had happened. 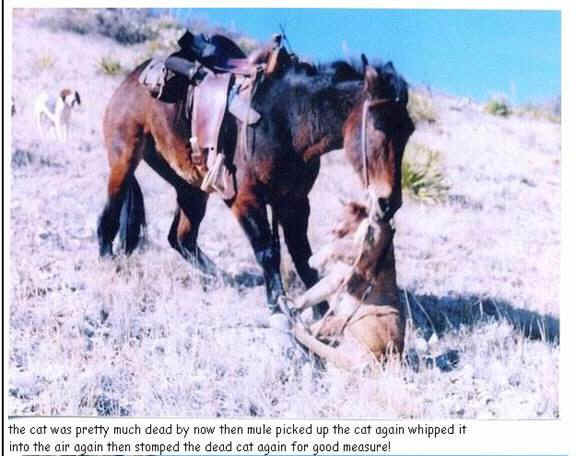 These pictures and the story about the lion-killing-mule circulated for quite a while on the Internet before Steven Richards got the real story and published it in Western Mule Magazine. The mule’s name is Berry and it belongs to 25-year old Jody Anglin from New Mexico. Anglin says he enjoys hunting mountain lions and is usually accompanied by a cadre of hunting dogs. In 1998 he got Berry to assist with the lion hunts. On the first hunt, Berry was attracted to the carcass of a lion that Anglin had shot and sort of nuzzled it and nibbled at it. With each new kill, however, Berry got more animated and couldn’t wait to get to the dead lions. The pictures in the eRumor were taken in 2002 or 2003 and show Berry toying with a lion that was already dead, not killing it. Someone along the way created the story about the Montana couple, the stalking lion, and the fanciful descriptions of the pictures. The hunter got off the mule with his rifle and decided to shoot in the air to scare away the lion, but before he could get off a shot the lion charged in and decided he wanted a piece of those dogs. With that, the mule took off and decided he wanted a piece of that lion. That’s when all hell broke loose… for the lion. As the lion approached the dogs the mule snatched him up by the tail and started whirling him around. Banging its head on the ground on every pass. Then he dropped it, stomped on it and held it to the ground by the throat. The mule then got down on his knees and bit the thing all over a couple of dozen times to make sure it was dead, than whipped it into the air again, walked back over to the couple (that were stunned in silence) and stood there ready to continue his ride… as if nothing had just happened.